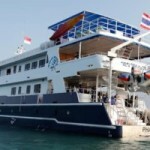 Malaysia Liveaboards to Sipadan and Layang Layang dive sites along with Malaysia’s east coast including Pulau Tioman, Pulau Aur and Jack Rock. 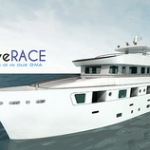 The liveaboard season to Layang Layang is from March to August and year round for the Sipadan Liveaboard. Dives at Sipadan, Mabul and Kapalai. 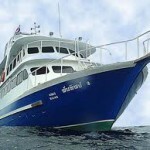 Our Verdict: The only liveaboard with Daily Dive Permits to Sipadan. Modern, spacious with nice cabins. Nitrox available. Dives at Pulau Tioman, Pulau Aur, Jack Rock, 7 Skies Wreck, Igara Wreck. Our Verdict: Scuba Diving everyday at Sipadan. 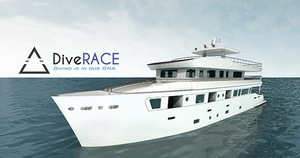 The only liveaboard going to Sipadan. Modern and comfortable. Nitrox available. Our Verdict: Lower budget boat. Nitrox available. Our Verdict: Huge boat with high levels of comfort, safety and service. Luxury cabins have private balconies. Malaysia has some of the best SCUBA diving in the world. Sabah is particularly blessed. Sipidan Island is on most divers wish list, it truly is outstanding diving. Mabul and Kapalai are macro divers heaven. A dive vacation at a Mabul or kapalai resort combining the critter diving with big fish dives at Sipadan is as close to a perfect holiday as most divers will ever get. Lankayan is a tropical island paradise with just one eco friendly resort. Reef sharks swim up to the shore. There is a small wreck that can be dived just by stepping off the jetty. Some divers see whale sharks at Lankayan but it’s renowned more for the jawfish that inhabit the reefs. Layang Layang gets visited by schools of hammerhead sharks every year. 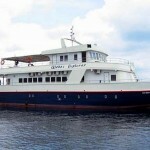 It is dived by Malaysia liveaboards from April to July and there is also a resort on the island. The best months to encounter hammerhead sharks are April and May. Visibility is superb, big fish are abundant and soft corals are healthy. Labuan is popular for wreck diving and Kota Kinabalu has the TARP close off shore. On the Malaysian Peninsular Tioman, Redang and the Perhentian Islands are all popular from May to October. There are also some excellent wreck dives suitable for experienced divers and very popular with techies. These include the Seven Skies Wreck.